PayPal Significantly Enhances Global Payout Capabilities With Acquisition of Hyperwallet | PayPal, Inc.
SAN JOSE, Calif.--(BUSINESS WIRE)-- PayPal Holdings, Inc. (NASDAQ: PYPL) announced today that it has agreed to acquire Hyperwallet, a leading global payout platform, for $400 million in cash, subject to certain adjustments. 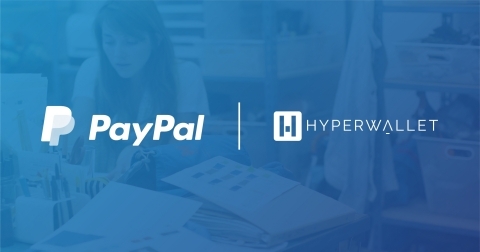 The acquisition of Hyperwallet enhances PayPal's payout capabilities, improving the company's ability to provide an integrated suite of payment solutions to ecommerce platforms and marketplaces around the world. According to Internet Retailer, marketplace sales accounted for more than 50% of global online retail sales in 2017. "Ecommerce platforms and marketplaces are leveling the retail playing field by connecting buyers who have specific needs with groups of sellers that can meet them," said Bill Ready, chief operating officer, PayPal. "Merchants and service providers who use these platforms want quick, efficient, flexible and secure access to their earnings, whenever and wherever they need them. By acquiring Hyperwallet, we will strengthen our ability to provide an integrated end-to-end solution to help ecommerce platforms and marketplaces — however large or small — leverage world-class payout capabilities in over 200 markets." Upon closing, PayPal and Braintree merchants will gain localized, multi-currency payment distribution capabilities in more than 200 markets with numerous disbursement options, including prepaid card, bank account, debit card, cash pickup, check and PayPal. "We are thrilled to be joining forces with a powerhouse like PayPal," said Brent Warrington, CEO, Hyperwallet. "Combining Hyperwallet's advanced payout capabilities with PayPal's scale will bring increased value to both Hyperwallet's and PayPal's customers. This is an outstanding opportunity to supercharge Hyperwallet's growth and further our mission to pay the planet." The transaction is expected to close in the fourth quarter of 2018. The completion of this transaction is subject to customary closing conditions, including regulatory approvals. Perella Weinberg Partners LP is acting as sole financial adviser to PayPal, and Skadden, Arps, Slate, Meagher & Flom LLP is acting as its legal adviser with regard to the transaction. Raymond James & Associates, Inc. is acting as sole financial adviser to Hyperwallet, while Goodwin Procter LLP is acting as its legal adviser. Fueled by a fundamental belief that having access to financial services creates opportunity, PayPal Holdings, Inc. (NASDAQ: PYPL) is committed to democratizing financial services and empowering people and businesses to join and thrive in the global economy. Our open digital payments platform gives PayPal's 237 million active account holders the confidence to connect and transact in new and powerful ways, whether they are online, on a mobile device, in an app, or in person. Through a combination of technological innovation and strategic partnerships, PayPal creates better ways to manage and move money, and offers choice and flexibility when sending payments, paying or getting paid. Available in more than 200 markets around the world, the PayPal platform, including Braintree, Venmo and Xoom, enables consumers and merchants to receive money in more than 100 currencies, withdraw funds in 56 currencies and hold balances in their PayPal accounts in 25 currencies. For more information on PayPal, visit www.paypal.com/about or follow us at @PayPalNews. For PayPal Holdings, Inc. financial information, visit investor.paypal-corp.com. This announcement contains "forward-looking" statements within the meaning of applicable securities laws. Forward-looking statements and information relate to future events and future performance and reflect PayPal's expectations regarding the impact of this transaction on PayPal's and Hyperwallet's financial and operating results and business, the operation and management of Hyperwallet after the acquisition, and the timing of the closing of the acquisition. Forward-looking statements may be identified by words such as "seek", "believe", "plan", "estimate", "anticipate", expect", "intend", and statements that an event or result "may", "will", "should", "could", or "might" occur or be achieved and any other similar expressions. Forward-looking statements involve risks and uncertainties which may cause actual results to differ materially from the statements made, and, accordingly, readers should not place undue reliance on forward-looking statements and information. Factors that could cause or contribute to such differences include, but are not limited to, the timing and possible outcome of security holder and regulatory approvals in connection with the transaction, the possibility that the transaction may not close, the reaction to the transaction of Hyperwallet customers and business partners, the reaction of competitors to the transaction, the retention of Hyperwallet's employees, PayPal's plans for Hyperwallet, economic and political conditions in the global markets in which PayPal and Hyperwallet operate, the future growth of PayPal's and Hyperwallet's businesses and the possibility that integration following the transaction may be more difficult than expected. More information about these and other factors can be found in PayPal Holdings, Inc.'s most recent Annual Report on Form 10-K, Quarterly Reports on Form 10-Q, Current Reports on Form 8-K and other filings with the Securities and Exchange Commission (the "SEC"), and its future filings with the SEC. The forward-looking statements contained in this press release speak only as of the date hereof. PayPal expressly disclaims any obligation or undertaking to disseminate any updates or revisions to any forward-looking statements contained herein to reflect any change in the expectations with regard thereto or any change in events, conditions or circumstances on which any such statement is based.